In 2011, the City of Scott began work on its first formal comprehensive plan, Scott 2032. The plan strives to make Scott more resilient to flooding risks, while also laying the groundwork for land use planning, economic development, historic preservation, and recreation and transportation improvements in the city. Early in the planning process, the Scott 2032 consultant team began engaging the community to identify the shared goals and concerns of citizens and to create an exchange of ideas between the city government, consultants, and community. The public participation strategy involved meetings with the 17-person Advisory Committee, members of the 36-person Stakeholder Group, and other citizens. A key component was a “Charrette Week” involving a town hall meeting, focus group sessions, and presentations by consultants. Most of the concerns, goals, and desired outcomes outlined in the plan were initially identified through the public engagement process. Scott welcome sign. Photo via Wikimedia Commons. The Scott 2032 Plan addresses three major categories of threats undermining the resiliency of the Scott community, namely frequent flooding, absence of a zoning code, and limited government capacity for land use planning. By incorporating Smart Growth principals, stormwater management strategies, and steps to increase economic development, the Scott 2032 is laying the groundwork to help the city establish itself as the community of choice for residents and businesses looking to locate in the Acadiana region. The Scott 2032 Plan outlines goals for improving natural systems, including minimizing risks from flooding, managing stormwater, building a greenway park system, and preserving trees and soils. Improvements to other infrastructure and services are outlined in the plan, as are steps for improving city government and strengthening the economy of the city are included in the plan. The city government needs to grow to meet the needs of its citizens and businesses. Scott is located outside the area of concern for storm surge, and has a limited risk of flooding from levee failures compared to many other areas in south Louisiana. However, major storm events can cause flooding from stormwater back-up in natural channels and drainage ditches. Scott is taking a multifaceted approach to managing the flow of stormwater and reducing development in flood-prone areas, including land use ordinances, property acquisition and conservation easements, creating flood data inventories, GIS mapping, increased FEMA compliance and regular drainage ditch and stream maintenance measures. Recognizing that stormwater is not confined to municipal boundaries, Scott is taking a step in the right direction by coordinating with Lafayette Consolidated Government on stormwater management planning and channel maintenance. Develop a comprehensive approach to stormwater management including: regional coordination, a drainage channel/structure maintenance plan, compiling a hydrology data inventory, and adopting land use ordinances that will restrict development in the floodplains and floodways, reduce erosion, and encourage the use of stormwater management best practices. Hire a full-time floodplain manager to coordinate stormwater management activities. Reduce pollution through regular recycling and solid waste pick up, along with special days for hazardous wastes and “white goods” (such as appliances and electronics). Through transportation planning based on Smart Growth and Complete Streets principles and best practices, the Scott 2032 Plan aims to improve how people travel within the city. Include expanding the sewer system, building an additional wastewater treatment facility, constructing a water tower, returning recycling and hazardous waste pickup, building a new emergency services complex and library, and locating a regional Acadiana Welcome Center in one of the city’s historic houses. Creation of a Capital Improvement Program that prioritizes infrastructure improvements between immediate, short-term, and long-term needs and assigns projects to government agencies. Creation of a Transportation Improvement Plan and adoption of goals and principals that consider the needs of pedestrians and cyclists along with automobile users (Complete Streets). Improve connectivity and access from the interstate. Develop a citywide sewer and water master plan to determine needs for the future. Plan for the construction of new sewer lines, a treatment plant and a water storage facility north of I-10 where the city is experiencing the most growth. Discourage use of septic tanks that are a source of non-point water pollution. Implement a code enforcement program within the Department of Public Works to insure compliance of existing and forthcoming civil ordinances, promote safety, and protect property values. 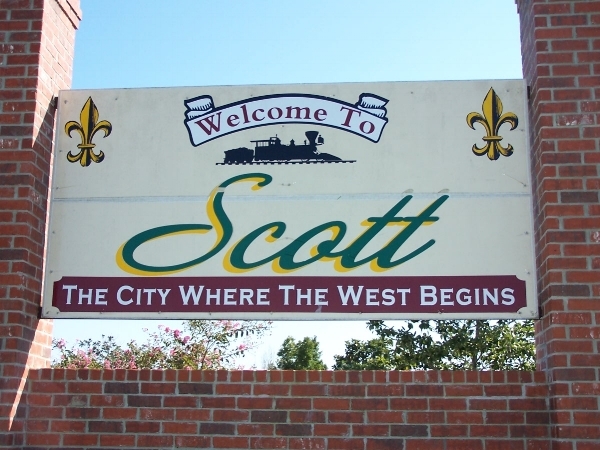 Currently, Scott lacks departments and commissions for city planning, parks and recreation, and economic development. No one in the public works department is responsible for overseeing the maintenance of drainage ditches and channels. Hiring new city staff and establishing commissions for these departments is critical for successful and efficient implementation of the Scott 2032 plan. Establish a community planning department and planning commission to attract and direct future growth. Create positions for economic development and recreation as well to grow the capacity of city government. Adopt Smart Growth land use controls that promote resiliency: using the SmartCode as a zoning ordinance and creating a land use plan tailored to the unique conditions and desired future of the City of Scott. Developing a system of greenways (linear parks) on the undeveloped land in the 100-year floodplain and floodway. This will reduce loss of life and property during major storms and create a valuable recreational asset for the community. Create incentives for infill businesses development in the city center. Drive economic development through the leveraging of special tax districts including tax increment financing (TIF) districts along the major transportation corridors. Build civic pride and attract visitors to the city. The city will take an active role in promoting art, history, and culture through the creation of cultural and historic districts with public amenities, leveraging special tax programs, and forging private-public partnerships to run festival and regular public markets. Prepare emergency evacuation plans for the city that consider man-made disasters, not just storm events, such as rail accidents and chemical spills on the interstate.